I bought a set of 14" x 7" Rally II wheels off a late 70's Camaro at a junk yard. They're the same style of Rally wheel that was originally available on 1971 - 1979 Novas. I also replaced the sagging rear springs with a new set of 5-leaf springs from Classic Industries. 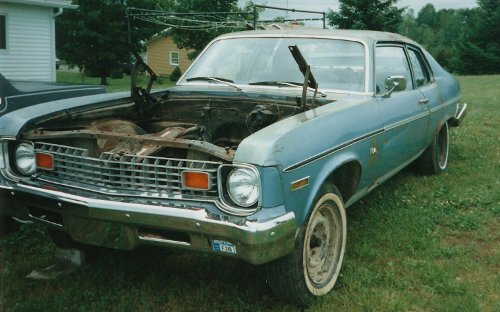 I purchased a rusty 73 Nova 2-door parts car that had a somewhat rough but useable blue bench seat interior. I took the seats to an upholstery shop and had them re-upholstered. I had them stay with the original configuration (cloth seating areas with vinyl sides). The original style cloth was no longer available and I didn't really care for it anyway so I just picked out some that I liked from their sample books. The arm rest areas of the door panels had a few cracks but overall the panels were still better than the ones that were originally in my Nova. After giving them a thorough cleaning, I used a Permatex vinyl repair kit to fix the cracked areas and sprayed them with some Plasti-Kote vinyl dye. Aside from a slight grain texture mis-match, the vinyl repair kit did a decent job of repairing the cracks. I didn't bother trying to mix the colors included in the kit to get a good color match since the panels were faded and needed to be dyed to bring back their color anyway. 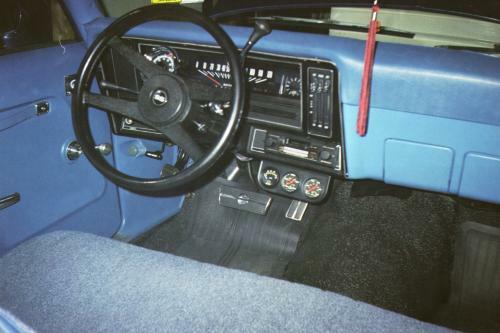 Here is the new blue interior in my 74. The color change required re-painting the metal part of the dash and narrow section of metal that runs between the bottom of the rear window and package tray. Painted the grille black with silver stripes on the upper and lower horizontal bars. Replaced the Chevy bowtie grille emblem with an SS emblem. Replaced the Nova fender and trunk emblems with SS emblems. 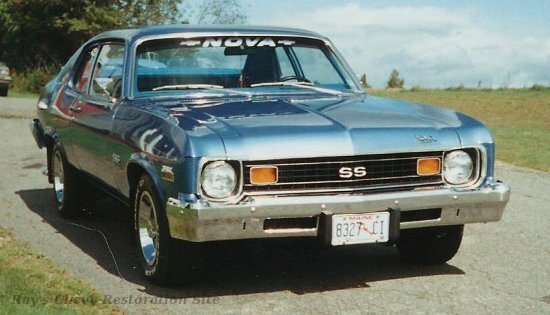 They're technically correct for a 73 but I like the looks of them better than the 74 "Nova SS" decals. Added bullet-style sport mirrors. I painted them body color even though black would have been correct for a 74 SS. Swapped the original steering wheel for a 4-spoke sport steering wheel with an SS horn cap. 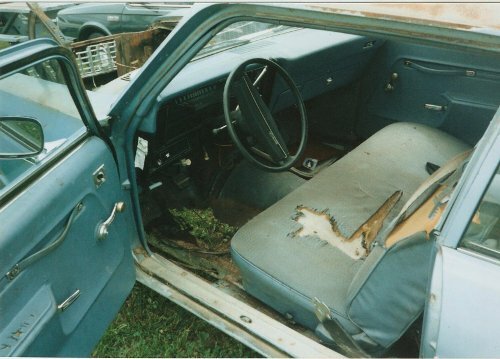 I don't think this style of steering wheel was originally offered in 74 Novas. And later on (after these photos were taken), I replaced the Rally II wheel center caps with the SS style caps. 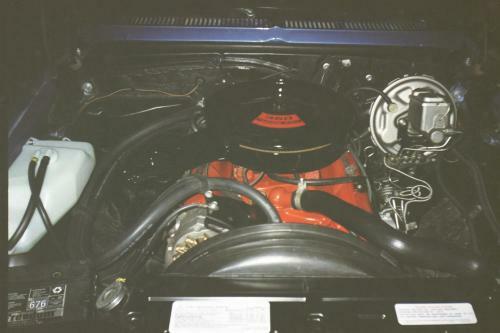 The 73 SS fender and trunk emblems mount with three studs while the 74 fender and trunk Nova emblems only used two. To avoid drilling extra holes, I "cheated" by cutting one mounting stud off each emblem. That allowed the trunk and driver side fender emblems to fit right into the existing holes. But due to the way the emblem mounting studs are staggered in height, that trick wouldn't work on the passenger side fender without locating the emblem back too far. So I had to cut a different stud on that emblem and drill one new hole in the fender. Luckily, the SS emblem covers the unused hole from the Nova emblem. And the Nova emblem will cover the hole I drilled should I ever decide to put those emblems back on the car. Even with relatively new shoes, the old manual drum brakes left a lot to be desired so I swapped them out for new power front disc brakes. I also replaced the old points distributor with an HEI. The details for both swaps can be found in the technical information links on my main page. While I was doing the HEI swap, I also swapped out the 2bbl intake manifold and carburetor with a 4bbl intake and Quadrajet carburetor. I used an earlier year intake manifold to eliminate the EGR valve and associated vacuum lines. 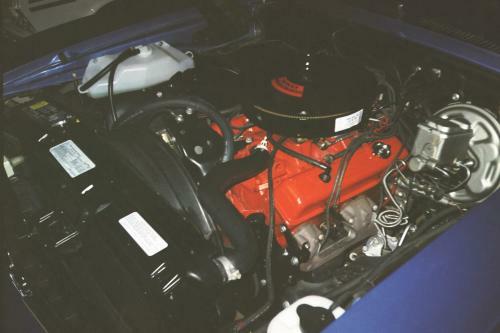 This reduced some of the clutter and gave the engine a cleaner but still stock appearing look. The carburetor swap required the use of a different air cleaner housing and it also needed to have a notch to clear the HEI. After searching through a few junk yards, I found an early 80's air cleaner that fit the bill. Aside from having an oval shaped snorkel it appears very similar to the original. I installed a new 2 1/4" mandrel bent exhaust system made by Heartthrob Exhaust. It's their #8144710 kit designed to bolt up to the factory exhaust manifolds. I believe it was originally designed for shorter wheelbase Camaros and Firebirds so I had to add a couple extensions to the head pipes to properly locate the mufflers. Other than that, it was a really good fit. I replaced the old rear bumper that was getting rusted pretty thin from the inside with a re-chromed bumper from Bumper Boyz. Later in the spring of 2000 I replaced the front bumper. When they re-chromed the front bumper, they welded up the bumper guard mounting holes. Oh well, I didn't really care for those large rubber bumper guards anyway. Update: I have read mixed reviews about the quality of Bumper Boyz re-chroming. Evidently I got lucky because the bumpers I received were quite nice looking and have held up very good over the years (this update written in 2014).